You don't need to have a beach or garden wedding to make a lasting impression on your guests. 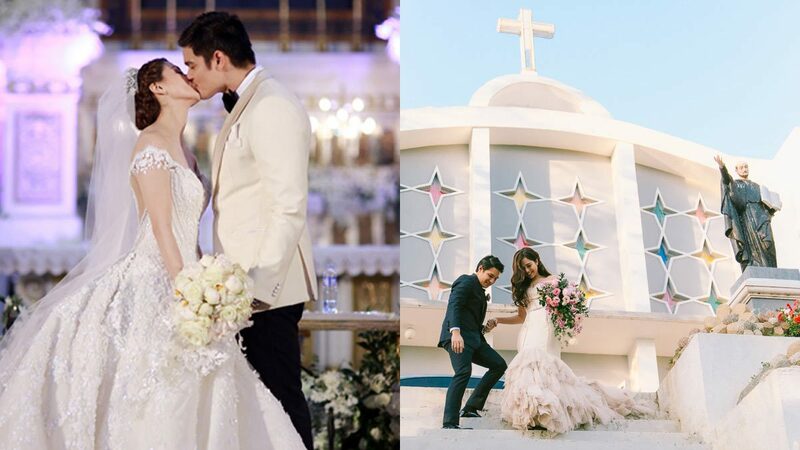 Take it from these Pinoy celebrity couples, whose weddings are the perfect balance between traditional and totally memorable. Fans of this long-time couple were swooning when they finally tied the knot after eight years together. Gideon Hermosa transformed the church into a breathtaking sea of white, with billowing curtains, crystal chandeliers, and a canopy of floral bouquets. The bride's entrance was even more ethereal as she emerged with a wall of blue and white flowers behind her. If you're tying the knot in a grandiose church, take your cue from our favorite (and super-hilarious and chill) celebrity couple. These two let the awe-inspiring architecture of this centuries-old church speak for itself as they exchanged one of the most romantic wedding vows ever. Meanwhile, their stylish entourage donned gowns in varying shades of blush with the prettiest flower crowns to boot. This creative nuptial is proof that you can inject plenty of fun personality into your elegant wedding. This romantic affair was all sorts of charming, from the illustrated wedding invites by Rob Cham to the DIY boutonnieres (comic book-themed!) and souvenir giveaways (a mix CD, of course). Another tear-jerking detail? Saab Magalona walked down the aisle with a locket that had her late father's photo. If you're thinking of doing a non-traditional wedding, take inspiration from Kean Cipriano and Chynna Ortaleza's intimate ceremony. The bride skipped the usual white gown and opted for a laced gray number by Edwin Tan, which also came with a dramatic gray cape. The venue, styled by Teddy Manuel, had no flowers; instead, it was filled with rustic details that looked right out of a ~*dark and dreamy*~ fairytale. This much-talked-about celebrity wedding in 2014 was nothing short of lavish. The Primetime King and Queen exchanged vows at the Immaculate Conception Cathedral, where a massive LCD screen was set up for eager fans who were standing outside the church. Aside from a star-studded guest list, people couldn't get enough of Marian Rivera's jaw-dropping lace gown by Michael Cinco, which reportedly cost a whopping P2 million! If "simple" is more of your style, get inspired by Kaye Abad's wedding in Paul Jake Castillo's Cebu hometown. The church was elegantly decorated with white floral garlands and instead, put the couple incenter stage. Of course, who could forget her gorgeous gown (and its intricate bodice) by designer Francis Libiran? We're swooning! Just days before tying the knot in an all-white Boracay wedding, this couple jetted off to Makati to exchange vows in the coolest outfits ever! Instead of an everyday white gown, Maxene Magalona chose a one-shoulder tea-length dress which she paired with a white leather jacket to match Rob Mananquil's black leather jacket. They also styled the jackets with patches and wrote the words "Just Married" on the back. Too cute! Meanwhile, the male guests were asked to wear black while the female guests came in blush—the couple's favorite colors.